It is their hope that through these stories and experiences of real people, people like this family of singers and writers of gospel music, that a whole new generation of seekers will be encouraged to apply God's living Word to their own daily lives, and that those who have a long history with God will be inspired to finish the race with joy. 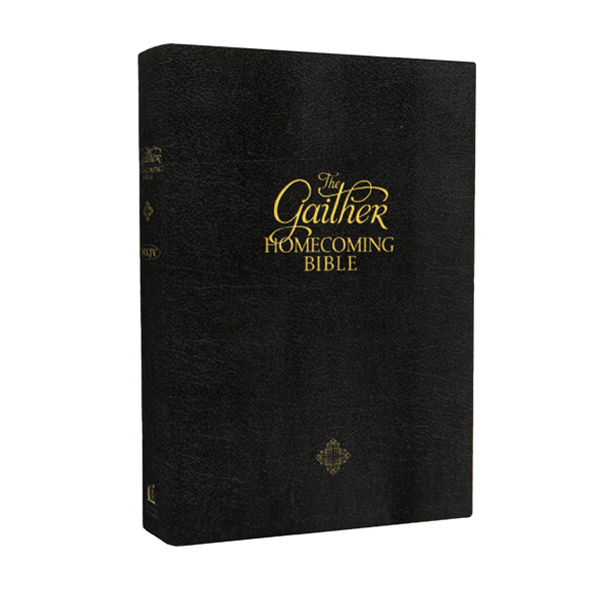 The Gaither Homecoming Bible features original poetry and insights from Bill and Gloria Gaither and exclusive devotionals from 60 Homecoming artists, including The Hoppers, The Isaacs, The Booth Brothers, Mark Lowry and Ernie Haase. ~ 230 devotionals written by Bill and Gloria Gaither with 60 Homecoming artists ~ Numerous reflections on Scripture and poems by Gloria Gaither ~ 75 in-depth looks at some of the most beloved hymns and gospel songs, including many written by Bill and Gloria Gaither ~ 5 features discussing the importance of hymns and gospel songs ~ A custom Gaither Homecoming Bible Reading Plan ~ 100 quotes from historical and contemporary Christian thinkers about great songs and their importance. A New King James Translation. Black Bonded Leather cover, 1600 pages.